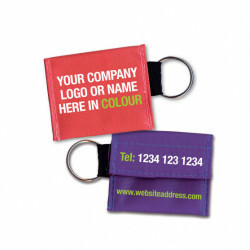 Purchase 50 or more PERSONALISED Key Ring/Clip with CPR Face Shields and download your free support pack worth £100. Purchase 200 or more PERSONALISED Key Ring/Clip with CPR Face Shields and you can have personalised covers absolutely free! 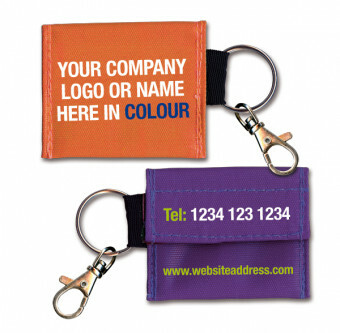 Personalise your key rings and promote your brand! Available in a variety of colours, these durable Velcro seal pouches contain a filter resus-shield and can be fully personalised on both sides to suite your company branding. Available in: Green, Red, Dark Blue, Purple and Black. Minimum order 500. One off set-up fee of £45 applies, which includes two alterations to initial artwork. Additional alterations will incur a further £45 charge.